Today we are going to be reviewing the Razorba back hair shaver, also called the Razorba Classic. This is the lowest end model that Razorba has to offer in their line of back shaving products. So, in this post, Razorba Back Hair Shaver reviews, I hope to run through a pretty thorough outline of the features to better help someone looking for a back shaver to make the best possible choice. Let’s face it, back hair is ugly and unwanted. Women for the most part just simply hate it! It serves virtually no purpose in our modern age. It only serves as a hindrance to the men and yes, even ladies that might be unfortunate enough to be cursed with it. The Razorba would definitely work better with the G.O.A.T. over a traditional disposable razor, you can read my review of the Razorba Goat here, Razorba GOAT Wide Disposable Double Razor Review. Also, check out, my other review on the next step up from the Classic, The Razorba Silencer, found here, Razorba Silencer Review. Then to top it off it is quite a challenge to rid oneself of back hair, due to the limitation of our arm movements. That is where Razorba comes in. What Is Razorba Back Hair Shaver? A couple of nice things about the Razorba is that it uses no batteries or charging. It is also designed to exist with your current beard shaver. Although check below for compatibility. As seen by the picture above, the Razorba Back Hair Shaver is a long tool that is used in conjunction with a standard razor (sold separately). This works with any standard razor. The standard razor fits easily within the Razorba Back Hair Shaver. Once inserted the razor remains securely in place but the angle can change on you when shaving. It remains securely in place due to the inside where you put the razor is tapered and an inner tube made of rubber which also grips the razor firmly. The ergonomic design of the handle and positioning of the razor allows for you to easily reach once hard to reach areas. It can more than handle all the contours of your back and allow for a good shave. You are able to efficiently hit all angles and become back hair free. ***A note here about buying a bigger shaving razor, Razorba has a big 4 1/2 inches wide razor specifically for fitting into the Razorba Back Shaver Classic, called Razorba G.O.A.T. They come in a package of 6 razors and they are a whopping 3 times wider than normal ordinary razors. The GOAT also has an aloe comfort moisture strip for sensitive skin. These can be used either wet or dry. This is the method I would shave with if given an option, as the wider head is so much more appealing to me than trying to shave with a standard beard shaver. Plus the GOAT has two razor, which gives a nice clean shave that never seems to cut you either. Get the G.O.A.T. and save yourself the time. So much faster. The handle is 17 inches long and has a shaving angle at about roughly 65 degrees. Any product that has been around a while surely is offering the public what it needs, as well as performing up to the customer’s standards. Razorba has been around since the year 2003, now that should offer relief to doubters. Surely the Razorba Classic works. The variables are what blade or blades you decide to opt with that will ultimately determine how well the Razorba will perform for you. As each person has different coarseness and amount of hair on one’s own back. Can be used with standard razors that you already have just laying around. 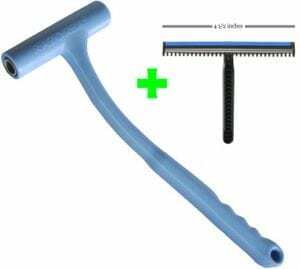 Can also be used with a wide razor that Razorba makes called the Razorba GOAT Wide Disposable Double Razor. I highly recommend upgrading to a wider blade over the standard beard razors, as GOAT razor is 4 1/2 inches wide and can be used both wet and dry. A hole at the end of the handle. This is for hanging directly through the hole or attaching some type of lanyard to it. Allowing you to effectively hang it in the shower. Allows you to do-it-yourself (DIY), instead of relying on family members or paying a stranger to shave you. Pain-free method of removing hair. Been around since 2003, shows longevity and a working design to be around that long. This should easily last a lifetime. Razorba also makes a Razorba Stud Stamper, this fits at the end and allows one to properly apply shaving cream to ones back. A lot of positive reviews online, raving of the Razorba. The company claims to be “The World’s #1 Selling shaver” for back hair. No embarrassment involved. Awkward incident avoided. Packaging is delivered discreetly. Another awkward moment avoided. 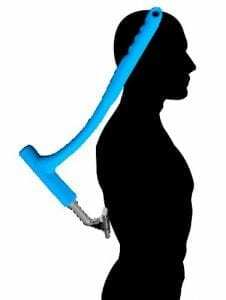 Reaches every part of your back easily. Using a standard razor about 1 1/2″ wide will take a long time to shave one’s back. As a back is a big area to cover. Harder to get the best optimal shaving angle when shaving and can lead to more irritated skin from shaving. This was at least my experience. The next day when showering I could feel where the razor had nicked me when shaving. Must order a Razorba G.O.A.T to get a larger blade width which is sold separately, I refuse to share an area that is large, like my back, with a beard razor. Especially after using a wide blade system, like bakblade or Bro Shaver. If you have long back hair and use the standard size razor, it will surely clog with hair in a single pass, leaving you to unclog the mess continuously. Long shave time due to the limiting size of the razor you use. Unless you spring for the Razorba Goat. The inability for the GOAT to completely lock the razor into place. I notice slight angle changes when shaving and had to adjust this a few times while shaving. How Much Does The Razorba Cost? The price for Razorba Back Hair Shaver (Classic) which is simply the handle. If you plan on using your own razor, this must be accounted for when determining the overall price of this system. This can vary from the cheap side (disposable) to expensive side as a pack of 5 razors can cost up to $35.00, and that’s just for the replaceable heads. Not including the actual shaving handle. But if you love your razor and you are happy with its performance cutting your back hair as well as your facial hair, by all means, use it. I highly recommend using the Razorba GOAT with any of the Razorba shavers. The wide head and multi-blade will leave you slicker than a dolphin in grease. Guaranteed to do in under 10 minutes too. The Goat cost for a packet of 6 a reasonable. What Razors Are Compatible With Razorba? 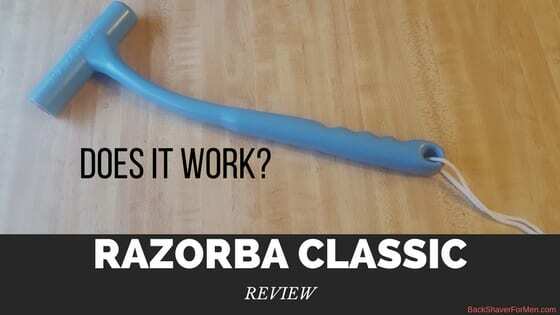 The Razorba Classic or it is also known as the Razorba Back Hair Shaver, one should know if it is currently compatible with the razor you currently have in your medicine chest. Below is a list of razors that will work. What Razors Are Not Compatible With Razorba? It is also important to know what razors will not fit or work with the Razorba Classic. Generally, the razors with the ergonomically bigger handles, as the larger diameter handles won’t fit within the Razorba Classic. Any type of electric trimmer. I generally overall like the Razorba and find it adequately handles my back hair business. I tried it with my own Schick Hydro 5 and I was able to do a good job with it, although the constant cleaning of the blade due to it clogging was tiresome. I have to use the Razorba G.O.A.T. and would much rather shave my back with this over any conventional beard shaver. With the GOAT, this sucker performs slightly better than a beard shaver, just because of its width. I did irritate my skin with from using the GOAT, as the correct angle was sometimes obtained and other times not so much. Leaving little cuts and nicks. As my back felt irritated for about twenty minutes afterward, and the next day after my morning shower. Without the GOAT, (boy that stuck me weird for a second), it wouldn’t be the choice for me, as the constant clogging get real old real fast with standard razors. So the Razorba Classic with GOAT, overall might be a sure-fire hit if you have light hair growth, but with hairy dudes, I would skip this one. Not My First Choice, But It Does Offer A Solution. Unable to rank Performance, due to the fact it doesn’t come with a razor. Unable to rank Comfort, due to the fact it doesn’t come with a razor and to use whatever razor you have. Unable to rank ability Not To Clog because no razor is sold with it. Razors don’t lock 100% when inserted, angle can change on you when shaving. Weird angle when razor inserted, doesn’t feel intuitive. The ability to use cheap disposable razors or your beard shaver. If you have any of your own experiences with the Razorba Classic or Razorba Goat, I would love to hear them. Or as well any questions or comments are always welcomed.